I wanted to give you a personal update. After a lifetime of hiking, biking and skiing in the White Mountains, I had hip replacement surgery on Wednesday. The surgery went very well and I’m excited to get back to work and back to all the activities that make the Granite State such a wonderful place to live. I appreciate the encouraging words I’ve received from so many of you. Thank you for your well wishes! 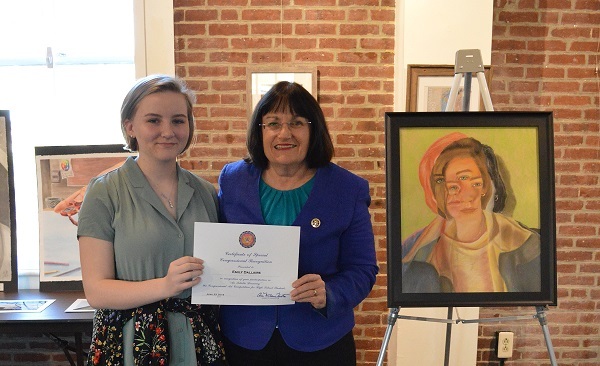 As a long-time supporter of funding for the arts and arts education, I've been proud to participate annually in the Congressional Art Competition since I took office in 2013. This wonderful event gives me the opportunity to encourage and recognize the artistic talents of young people across New Hampshire's Second Congressional District. On Monday evening, I hosted a reception at the Kimball Jenkins Carriage House in Concord to announce the winner of this year's competition, Ms. Emily Dallaire, a sophomore at Coe-Brown Northwood Academy. I congratulate Emily on this well-deserved recognition and thank all of the students who submitted pieces to this year's competition. I look forward to admiring Emily's drawing, 'Seeing Double,' on a regular basis in the Capitol building. 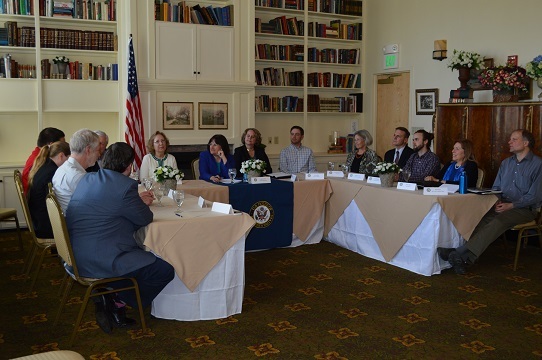 On Monday in Claremont, I joined with local officials and business leaders to discuss the employment landscape in the city and the types of programs that can expand economic competitiveness and opportunity in the region. While Claremont, and New Hampshire as a whole, has one of the lowest unemployment rates in the country, that doesn’t mean there isn’t more to be done to improve economic opportunity for Granite Staters. We need to be investing in programs that bring together employers and educators to expand training or provide apprenticeships so that businesses can fill available jobs with workers in their region. These partnerships are already having a positive impact in Claremont and communities across the state and are a win-win-win for employers, workers, and the local economy. I also introduced the Surveillance and Testing of Opioids to Prevent (STOP) Fentanyl Deaths Act on Monday with Representatives Evan Jenkins, Tom MacArthur and Donald Norcross, my colleagues on the Bipartisan Heroin Task Force. Synthetic opioids, including fentanyl, are having a deadly impact throughout New Hampshire and the country. Public health officials face a daunting task identifying the various substances involved in an overdose and our legislation will support efforts to gain a more comprehensive understanding of the spread and impact of synthetic opioids. The opioid epidemic isn’t a partisan issue and I’m encouraged by the eagerness of both my Republican and Democratic colleagues to come together behind proposals that will help to address this national crisis. Granite State dairy farms are an important part of our state’s identity and economy and they help preserve open spaces and contribute to New Hampshire’s beautiful landscape. On Wednesday, I called on U.S. Trade Representative Robert Lighthizer to ensure protections for domestic dairy farmers during negotiations of the North American Free Trade Agreement (NAFTA). Specifically, our bipartisan letter raises concerns about a Canadian program that unfairly props up Canadian dairy producers at the expense of American farmers. We need to protect our dairy farmers from unfair trade practices that undermine dairy prices and put farms operating under already difficult circumstances at risk. Every American deserves access to quality affordable healthcare, and while the Affordable Care Act was an important step toward realizing that goal, Republicans and Democrats need to come together to make improvements to the law so that no one is left behind. Yesterday, I introduced the Pathway to Universal Coverage Act and the Easy Enrollment Act with Representatives Ami Bera and Kurt Schrader, my co-chairs on the New Democrat Coalition Affordable and Accessible Healthcare Task Force. These bills will help contain costs and expand access to healthcare to millions of Americans, and I will continue my efforts to get it passed through the House. My main job is to serve you, the people of New Hampshire’s Second Congressional District. If you have questions, thoughts or concerns, please don’t hesitate to reach out to my Washington, D.C. office at 202-225-5206 or my Concord office at 603-226-1002. Thank you and have a wonderful weekend!